What better ways to spend a fine day with a lot of snow outside? Roll them like how dung beatles do. Ah, the fresh winter air. Smelled like some mischief. Lock and loaded. 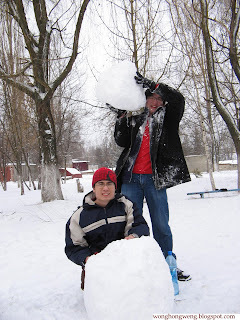 Snowball fight Russian style! It could have been a really awesome snowball fight. But then again, we're already too old for kids' stuff. We do what real men do now. Roll huge boulders of solid snow. 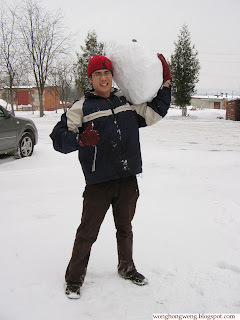 Snowballs like those could knock anyone out with just one hit. Get a lot of auxiliary snow. Loads of it. Our bulldozer. For the snow, or in class. Fill in the gaps between the boulders to get a tall, upright, rough figure. 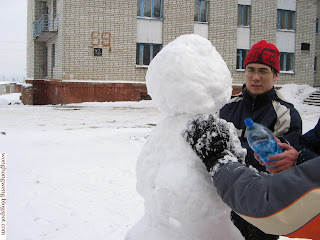 The secret to all snow sculpting is to use water. 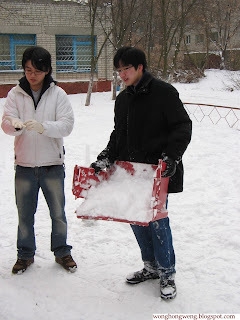 It melts and turns snow into slush, and the moment you paste slush onto a cold surface, it freezes into ice. Works fabulously like mortar plaster. Make her wet all over. This is what separates the men from the boys. Be reminded that sculpting requires some respectable amount of skill. Every woman's breasts should be firm and symmetrical. Note the meticulous intricacy from the hind view. It probably got so real that they became shy. Especially from the side view. Sadly it was only made of ice. Reap the fruit of your labour! We took slightly more than 3 hours with 4 crew members on the job. Few passers-by contributed a little bit, the rest were photo-parasites. 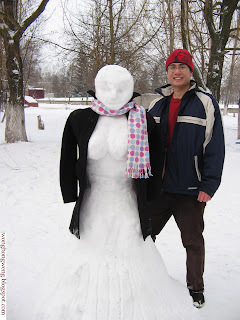 Snowman making is a fun thing to do, and if you ever had the chance at it, I would really recommend that you do. However, be aware that it is also very tedious, laborious and painfully cold. Dress her up like Barbie. What inspired us for this piece of art was what we did 4 years ago. 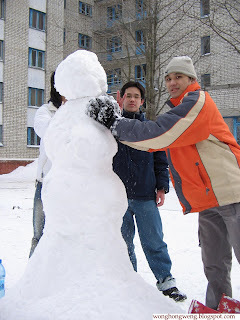 A few of us made a snowman; I guess we all wanted to send a good picture home for our folks to see. Well, you know, one good thing led to another. We just couldn't help it. 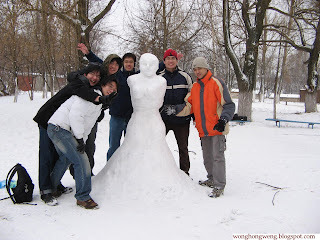 Archive photo of year 2004. Same mischievious crew. hi! great to find another new blog from here ! haha...nice one! 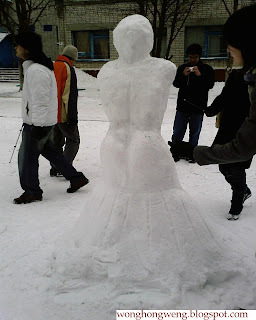 and the snow girl is .... nice! keep it up! Happy blogging!